Specialty programs are designed to give campers entering 1st & 2nd grade or 3rd-5th grade a more specialized experience while still enjoying the best parts of JCC Rainbow Day Camp. Campers enrolled in a specialty program spend the morning of each day with their traditional camp group and participate in the specialty program for some or all of the afternoon. All specialty program sessions are two week sessions, 5 days per week. Specialty programs must be selected at the time of camp registration. Rates below are 2-wk session rates. Explore the depths of camp with a magnifying glass and microscope. See what is hiding under our feet in the fishing pond, garden, and forest. Grab the measuring tools; it’s time to get cooking! 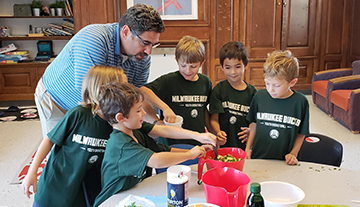 Campers will learn new recipes and proper cooking techniques while using fresh ingredients from our camp Garden! Campers will learn basic fishing skills and techniques on our fishing pond! Professionals from Four Seasons Skatepark will teach campers basic techniques and tricks for skateboards and scooters. Equipment is provided. Campers will have the opportunity to create different ceramics and pottery pieces! They will learn techniques and get the chance to glaze their masterpieces. Channel your inner ninja with our RDC Ninja Warrior. Campers will challenge themselves through different ninja courses and activities. Campers will learn different strokes and strategies through fun games and drills developed for Quickstart tennis. Open to all levels! 3, 2, 1, BLASTOFF! Campers will make and launch different types of rockets and airplanes. Get ready for some messy fun! Campers will explore different types of materials and techniques to create awesome camp art projects. Choo, Choo! These campers will work with model trains and develop new buildings and tracks! Campers will learn different strokes and strategie through fun games and drills developed for Quickstart tennis. Open to all levels! If I had a hammer and some nails! Campers will make birdhouses, bird feeders, tool boxes and much more while learning how to properly use tools. Spend some time during the day focusing on hands-on learning through science, technology, engineering and math! Be part of some amazing experiments! Design a display aquarium and help to catch frogs and salamanders for observation. Learn about their life cycles and what they need to survive. Campers will explore and build with different types of Legos. Become a master builder with both Lego kits and free play! Campers will participate in a musical theater production where they will learn theater techniques, dances and develop fun characters. Campers will create beautiful pieces of jewelry as well as cool keychains like lanyard and beads! This program is packed full of creative fun. Campers will learn what it takes to get food from a garden to the dinner table. Explore and experience the complete food process from soil to feast! Choo Choo! These campers will work with model trains and develop new buildings and tracks! Ever wonder what do to with leftover cans and bottles? Campers will make projects using all types of recycled materials. Watch out Darth Vader, these campers are going to be Jedi! Campers will make their own lightsaber and enjoy different Star Wars themed activities. Roll up your sleeves and grab your smock. This program will focus on paint in every way imaginable! Canoe, fish, pitch a tent and build a campfire! This program is perfect for campers who love to be outside and want to learn more outdoor adventure skills. Campers will get the opportunity to write, record, and produce the biggest cinematic masterpiece of the summer! Campers will create structures, cities, and even a map of camp out of Legos! This will include Lego kits as well as free play. Questions about RDC specialty programs? Contact Shelby Kass, RDC Associate Director, at 414-967-8248. A “Kids Center kid” is experiencing more in those before and after school hours than ever before. A social, recreational, educational and Judaic program for adults with developmental disabilities. The best summer experiences are the ones that can’t be replicated on a screen.